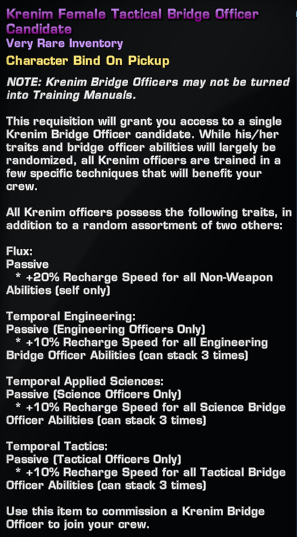 Once you’ve reached T3, the Research station offers three ‘special’ weekly projects. Only one of these projects may be slotted at any time, and once they are completed go into a 5-day cool down for all special weekly projects. So what do you get for your blood, sweat and tears? It’s actually pretty sweet. This is a genuine WTFBBQ moment, and one that the DPS League admins are honestly going to have to consider moving forward. Now while we don’t fully understand the mechanics behind +20% damage and +40% resistance, the implications are massive. This would be an awesome bonus if your leveling (more damage, more xp earned), but more importantly for the boys who like to pad their DPS numbers, suddenly almost anyone has the potential to be a higher DPS monster than before. A 10% bonus is – well – nice, but not Earth-shattering. 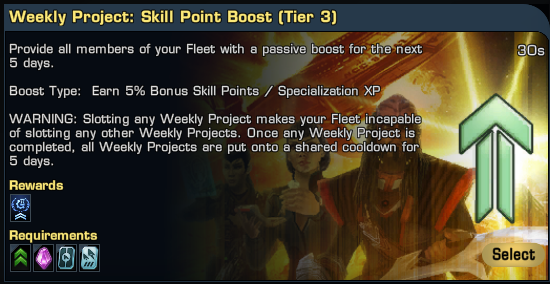 But if you time that (or stack that) with a Dilithium Weekend or special event, suddenly it’s a very nice-to-have bonus. But is it really worth it? Lets do some simple math: 10% bonus at the cost of 25,000 dilithium. OK lets pretend we are in a smallish fleet with 10 active members per day. The cost per member is 2500 dilithium. Earning 5K each a day, gaining 500 dill in bonus means the fleet breaks even half way through day one. Each player takes home an addition 2000 dil. That’s not bad. Lets push that math a bit more: 10% bonus at the cost of 25,000 dilithium. OK lets pretend we are in a largish fleet with 50 active members per day. The cost per member is 50 dilithium. Well, that’s starting to look very cool. *Yes. The math doesn’t tell the whole story, other than – it’s a good project to run. 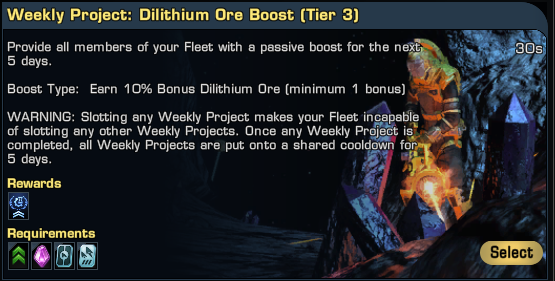 As with the dilithium project, this is a very nice bonus especially when you run it during a XP Weekend. 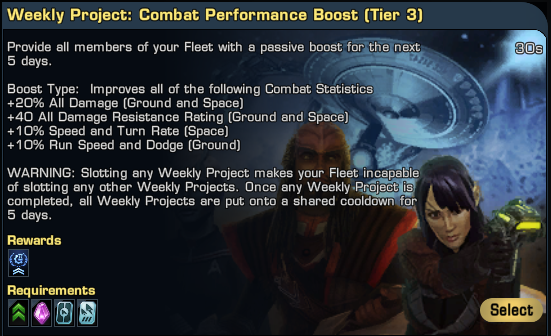 And, if it stacks with other bonuses, this could be a very beneficial project for alt development and ship mastery. At the moment the bonuses appear to be fleet-wide, but not Armada wide. Yes, I’m imagining the potential overkill if that were true. What interests me more is whether these types of projects will be made available for other fleet holdings. TY again to @primar13 for the screencaps and background information. 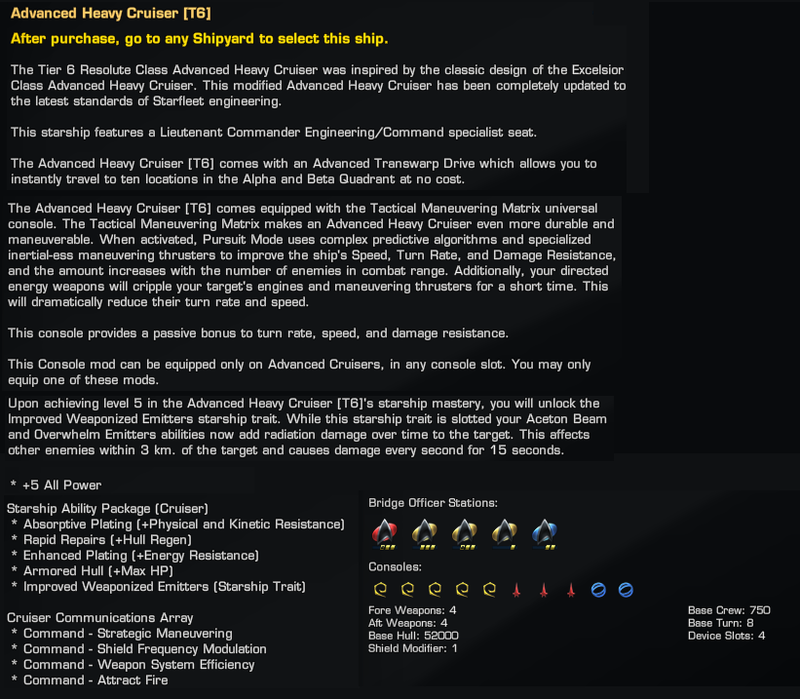 On the heels of Phil “Gorngonzolla” Zeleski announcement of the a T6 replacement for the venerable Excelsior was making it’s way into the game, we have advance knowledge of the stats for the Resolute and its Fleet-variant. It gets a Lt. Cmdr Eng/Command station. Despite the new seating, the first impressions are not that encouraging. The ship is not part of a set, which is breaking from the recent set offerings. It comes with the free trans-warp capabilities, offering a player more options on getting around. Likely price 3K Zen for a new skin, a mediocre mastery, and a marginal console. A side note on the UGLY image on in Phil’s post. TRENDY – SERIOUSLY – TAKE SOME BETTER SHOTS – AN ANIMATED GIF – HECK A SHORT MPG. You’re not making any converts. The ship mastery ability isn’t a must have, but the console has potential, especially if the game had a PvP element. Such a shame that PvP isn’t in Star Trek Online *sigh*. Unfortunately I’ll wait for others to try this ship first. 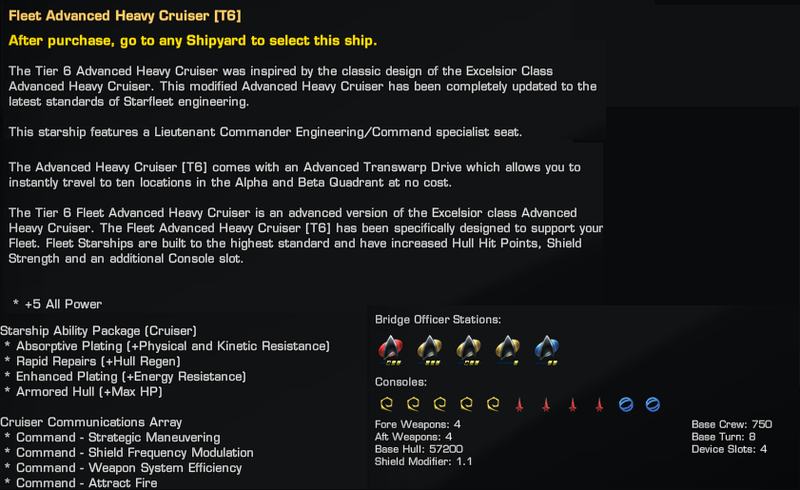 I wasn’t a fan of the original Excelsior, and it’s the one ship I never purchased while playing STO. Now give me a T6 Akira *cough, cough* and you can have my money. TY to CmdrSFC3 for capturing the information! This last entry for tonight has me very curious, and we can’t use them to create manuals. 10.5 is getting very interesting. As always, numbers on Tribble may not make it to the Holodeck, so take what I say here with a large grain of salt. Previous Previous post: Did Disco Balls just become canon – You be the judge?